Canadian Brass is a brass quintet founded by Charles Daellenbach, Stuart Laughton, and Gene Watts in 1970. 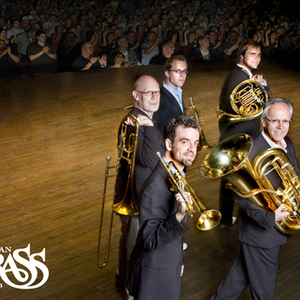 In addition to maintaining a heavy touring schedule, the Canadian Brass have recorded nearly seventy albums. They have commissioned, performed, and recorded hundreds of transcriptions and original works for brass quintet. They are best known for their ability to seamlessly cross between classical and jazz styles. They are also known for their unique performance attire, consisting of black suits coupled with white gym shoes. The current members are: Charles "Chuck" Daellenbach (tuba), Eugene "Gene" Watts (trombone), Bernhard Scully (horn), and the "Trumpet Dream Team" to fill the two trumpet positions on rotating basis. Dream Team members are: Ryan Anthony, Brandon Ridenour, Jeroen Berwaerts, along with previous members Josef Burgstaller, Ronald Romm and Stuart Laughton. Past members include: Stuart Laughton (1970?1971, 2003?2005), Josef Burgstaller (2001?present), Jeff Nelsen (2000?2004), Ryan Anthony (2000?2003), Frederick Mills (1972?1996), Ronald Romm (1971?2000), David Ohanian (1986?1998), Martin Hackleman (1983?1986, Jens Lindemann (1996?2001), Christopher Cooper (1998?2000) and Graeme Page (1970?1983).